500 ml and 1 Litre. is a non-toxic, non-flammable solvent with a slight yellow colour, it has a pleasant mild citrus smell, especially low *VOC's which means little is lost to the atmosphere. 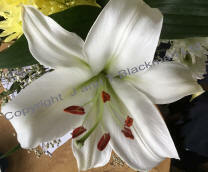 It is not an aggressive solvent and will take time to remove solid wax from a canvas. Only a small amount is needed to change the consistency of the wax or wax/oil mixture. Ideal for thinning the wax and oil mixtures to change the handling qualities and to make glazes. 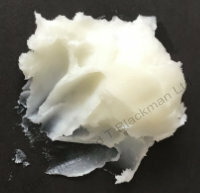 The wax/oil mixture can also be thinned to a 'thin cream' consistency if drizzles and drips are to be part of the work. When used for brush cleaning it can be saved for reuse, allow the fluid to stand so the paint pigment settles out, decant off the clear fluid, it can therefore be reused many times for brush washing. Because you need to be responsible for your own safety, have 'safety sense' when using solvents - don't eat, drink or smoke when using them (no water bottles in the same area!) and have a window open. In the example right - Oil paint and Cold Wax Painting Medium were mixed together, then thinned a little with Wax Solvent. A large Round Sash brush was used to create the effect, it was stippled onto the canvas to form the highlight of the tree top. 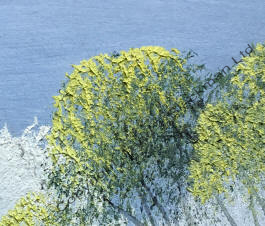 By using the Cold Wax Painting Medium, the texture is accentuated and representative, giving character. 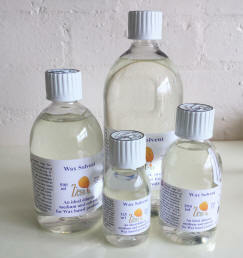 Use the Wax Solvent to thin wax mixtures, to a thin, runny consistency, use to glaze or to pour over embedded objects. 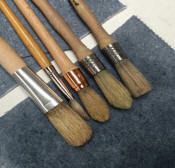 During and after painting there is a need to 'clean up', the brushes can be dried successfully on the Absorbant Mat. Use kitchen towel or a cloth to wipe knives and equipment clean, if stubborn residue, then add a small amount of Cold Wax Solvent to the cloth to clean up. If you have concerns about the air quality in your work space, then a consideration is to have plants in the space, they will help to keep the air clean. Recommended ones would be : - Dracaena, Sansevieria, Aloe Vera, Lady Palm, Spider plant, Peace Lily and Weeping Fig, plenty more beside these to choose from. If you are not very good at watering the plants, then select ones that will put-up with the drought abuse - Spider plant, Parlor Palm and Sansevieria would be three possible choices.